Farrar, Strauss and Giroux; 229 p.
Chris Adrian doesn’t think small. His first novel, Gob’s Grief, concerns itself with the construction of a machine to resurrect the Civil War’s dead; his second, The Children’s Hospital, opens with the modern world swept away by deluge. Each one sprawls, blending hard-scrabble realism with outright fantasy, enmeshing historical figures in ahistorical moments, colliding mysticism and scientific rationality. 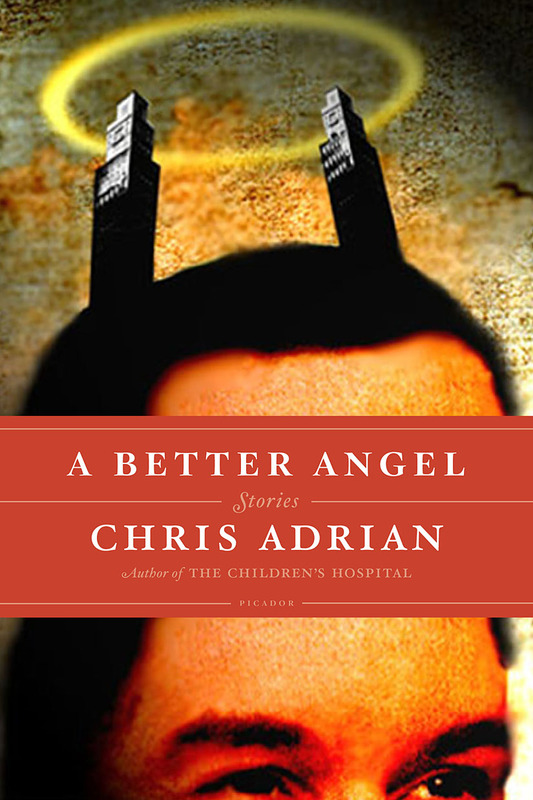 The endurance of trauma and the horrific side effects of a forceful will are themes that recur throughout Adrian’s fiction, and A Better Angel offers nine distillations of his preferred themes. In “Stab”, a child in silent mourning for his twin brother develops something — friendship isn’t quite the word, but neither is relationship — with an unstable classmate. Adrian’s strength here is in charting areas of uncertainty, of questioning the narrator’s perceptions — some may be authentic, while others may be byproducts of his own mythologizing. “Why Antichrist?” circles around a similarly flawed pairing — here, a pair of high school students whose fathers have recently died. In Adrian’s hands, the story veers into ambiguous horror, with its narrator uncertain of his own desires and comforts. There’s a surreal, supernatural component to both, though Adrian blurs the line between overt mysticism and a more untethered realism. In particular, one story’s closing lines could be taken as an affirmation of something beyond tragic or a retreat into fantasy triggered by the denial of everything around him. These aren’t easy stories to read. “Stab” details the killings of multiple animals, while “The Changeling” summons up brutal scenes of self-mutilation. Adrian doesn’t shy away from invoking national tragedies both historic and contemporary: the Civil War figures prominently in “A Hero of Chickamunga”, while the events of September 11th, 2001 inform three of the collection’s nine works. These aren’t neat encapsulations of tragedy — the starting point here leads Adrian to unexpected places, and there’s a tangible sense of fiction being used to unearth dimensions and perspectives on something that may not naturally come to mind. Certain tropes reoccur in these stories: imbalanced relationships, grief both personal and national, taut explorations of anatomy. By themselves, these themes and images are undeniably powerful; placed closely together as they are here, the similarities across the collection may distract from the intensity of each individual story. While the larger canvas of the novel allows Adrian to work out a greater differentiation within these themes, the mysterious immediacy of “Stab” and the disconcerting, hallucinatory mood sustained throughout “The Vision of Peter Damien” in particular demonstrate his dexterity at shorter length. Adrian’s strengths are in representing the horrifying power and aftereffects of ritual, of documenting the ways we interpret and justify the world around it, and of the unanticipated consequences of those interpretations and justifications. Brokenness, but also miracles. Transcendence, but also ruin.